The modest exhibition currently on display at the STC Tech campus puts the viewer in the role of an amateur archeologist. 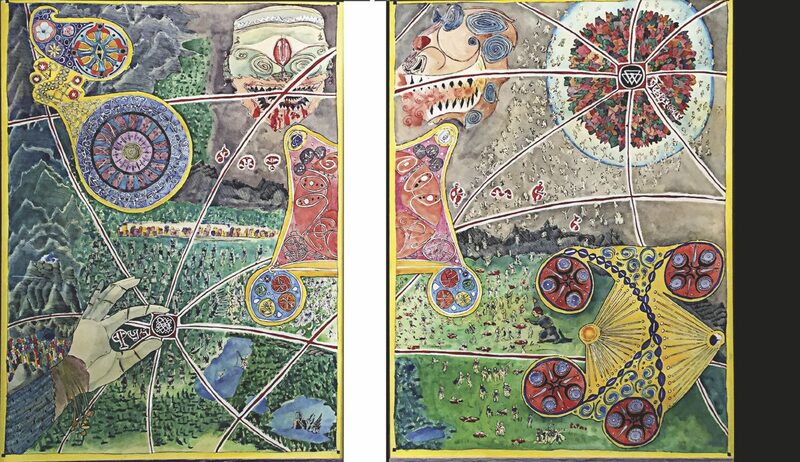 The viewer must figure out what Ansara is/was and what happened here, as depicted in these mysterious works in watercolor and ink. I use the past tense, because the overall impression of “Ansaros: The Beginnings of a World: Art of Alexis Garza” appears to be the historical remains of an ancient, unknown society, where only obscure information remains. No artist’s statement is posted, but the title implies a possible story, and a story is there; we just have to look closely and slowly to perceive what it is. Garza is an illustrator, author of several zines and comic books, and is currently an art student at UTRGV. This series fits into his youthful world view and seems as though it could be a basic concept for a graphic novel or video game. The transparent watercolors give an intimate look to works that ultimately include violence. The “Ansaros Stamp” appears to be a seal and is initially confusing. 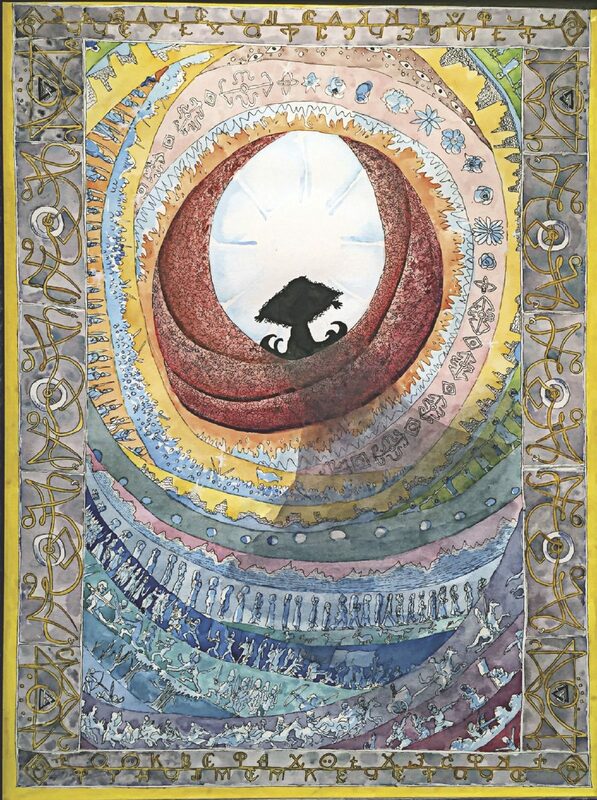 A generally undecipherable language is presented later in “Our Devotion to Elsia and Prayer,” but the phrase “the beginnings of a world,” incorporated in this watercolor, is written in English in an old English type face. This type style does not feel in keeping with the spirit of Garza’s concept. 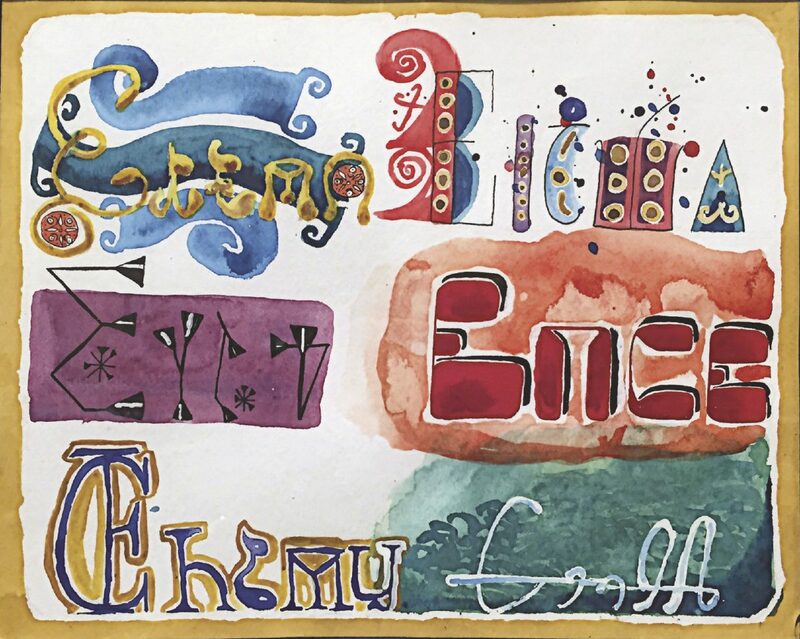 A few of the watercolors have borders reminiscent of illuminated manuscripts or Art Nouveau book design, providing an archaic richness. Delicate linear configurations within these borders and along other bands are beautifully conceived and drawn. 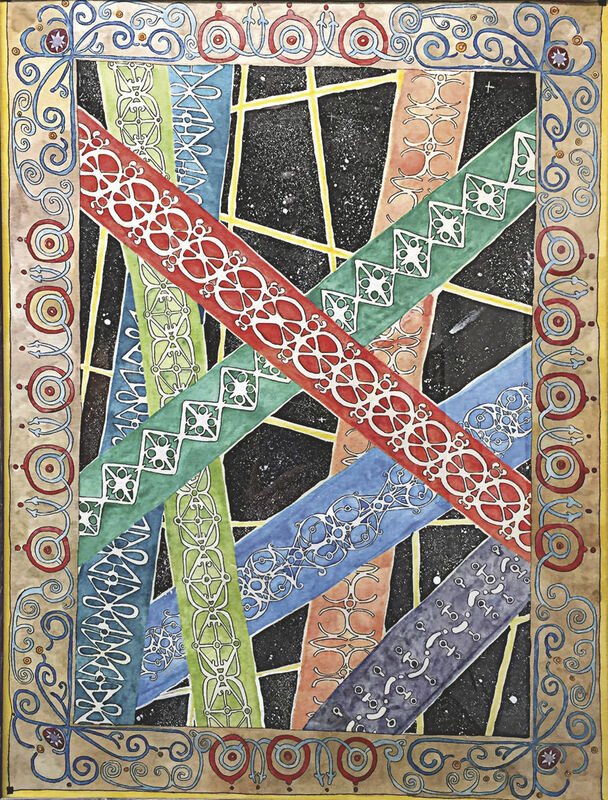 The watercolor and ink technique is well suited to the delicate designs and the many minute details crucial to the understanding of several of the scenarios in “Ansara.” “Our Devotion to Elsia and Prayer” and “Elsia as Written by Her Many Children” tell us about the culture — it is inhabited by several different peoples. The former work centers a color chart containing the primary and secondary colors, which, when blended with light, produces the central white point. 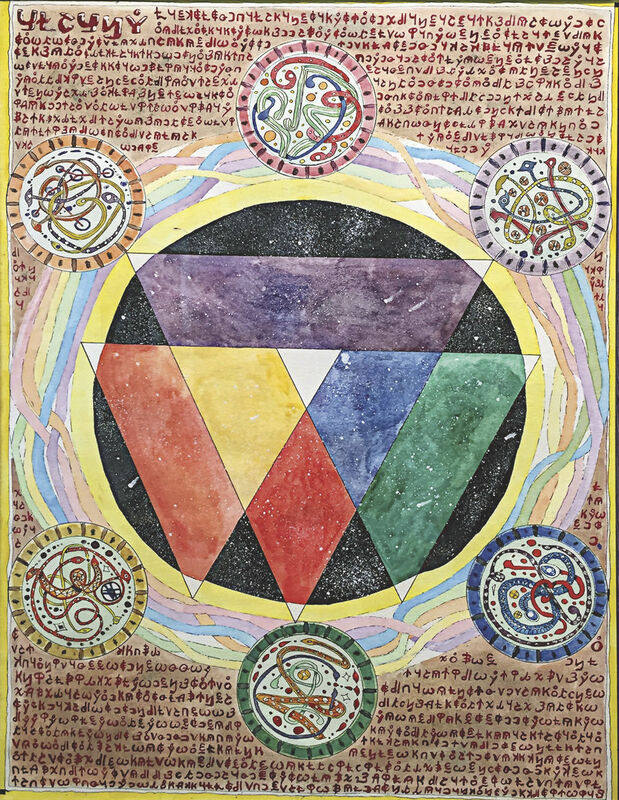 A rainbow-banded circle surrounds this chart, symmetrically punctuated by smaller diagrammatic circles, and the background offers the language of this world; it appears to be of the Cyrillic alphabet. So, did the Ansara world occur in the Slavic part of our own world around the 9th century? Is a potentially Biblical afterlife suggested in the work, “Sam (page 2)”? We are not told who Sam is, but a massive battle has left many dead, their white souls soaring upward. In “Sam (Page 1)”, Sam appears to be robotic and may be pushing the button of Godly/cosmic determination. panel, “Peoples,” breaks stylistically from the figure style previously established, possibly depicting the different beings who populate, or populated, this world. 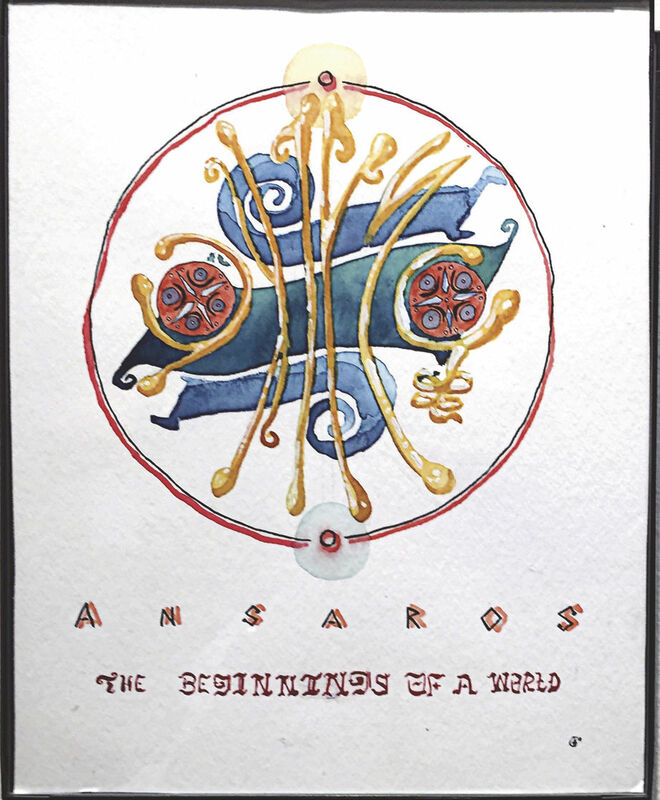 Although a few of these works are notably interesting, the overall flaw is the feeling that “Ansaros: The Beginnings of a World” is only a set of notes for a more detailed work to follow. This exhibit feels like an uncompleted idea. Nancy Moyer, Professor Emerita of Art the University of Texas Rio Grande Valley, is an art critic for The Monitor. She may be reached at nmoyer@rgv.rr.com.